Over the past 12 months, national planning policy has continued to focus on the removal of perceived impediments to development. Opposition to the Department for Communities and Local Government’s (DCLG) proposal to allow the change of use of “redundant” agricultural buildings to residential, without the need for planning permission, resulted in a concession exempting the National Parks. However, it was quickly followed by a further DCLG proposal to remove the need for planning permission when converting light industrial and storage and distribution buildings to residential use. We joined the Campaign for National Parks (CNP) in opposing this provision and await the outcome of this consultation. In November the results of a further consultation, this time on affordable housing, was announced. In a move ostensibly aimed at helping small developers, DCLG decided that developments of 10 units or less would not be required to include an affordable element. National Parks were given the option of working to a lower threshold of 5-units or less. 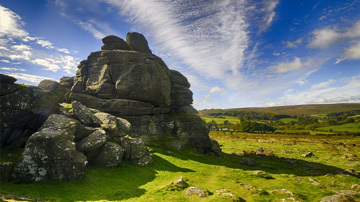 The Dartmoor National Park Authority (DNPA) has confirmed that the 5 unit threshold will apply. Its position is that its Development Management Plan contains a presumption in favour of sustainable development and that developments which do not contain affordable housing will not be considered as being sustainable. In the past year, the DPA objected to eight of the 700+ planning applications received by the National Park Authority – just over 1% of the total. Of the applications that we objected to, six were refused planning permission by the DNPA and one was granted, subject to conditions relating to its use and design. At the time of writing, two of the applications which were refused permission have gone to appeal. One of the applications which we opposed was a proposal to double the size of the Yennadon quarry by extending it onto common land. The DNPA refused this application in July 2014. The final one of the eight applications which we opposed related to an application for around 30 dwellings at Briar Tor, Yelverton. This may seem strange at first sight, as the DPA supports sustainable housing developments for local people in the National Park. However, our opposition in this instance was because the proposal fell well short of the DNPA’s policy requirement that 50% of the dwellings should be “affordable”. The DPA was also involved in two proposals just outside the boundaries of the National Park: we objected to the proposal for a 58ha PV panel “eco farm”, comprising a ground mounted solar photovoltaic system, at North Tawton; and the trustees approved a contribution towards the legal costs of opposing a large wind turbine at Den Brook – a case based on the need to monitor and control excessive noise intrusion from the turbine blades, which could have national implications. Unfortunately, the Den Brook protestors lost their case in the Court of Appeal. During the past twelve months, the DPA has worked closely with the CNP and other bodies to take part in a number of consultations and to lobby politicians on behalf of our landscapes and National Parks. In addition to the Planning Policy issues described above, we have opposed a proposal for Direct Elections to the National Parks, and commented on a review of designated landscapes by the Welsh Government. This review is considering significant changes in governance as well as re-classifying all types of designated landscape into one category and it could represent a threat to the retention of planning powers by the national park authorities. There is also a concern that any decision made in Wales might be read across to the rest of the UK. Closer to home, we commented on the DNPA’s proposals to introduce charges for pre-application planning advice. We are also participating in CNP strategy reviews relating to minerals, transport and upland farming. In the Autumn of 2014, the DPA, together with the other UK Friends of the National Parks societies distributed a manifesto to all of the candidates standing at this year’s General Election, seeking their support for a National Parks Manifesto, published by the CNP. The manifesto called upon the government to confirm its commitment to the National Parks, by taking action to strengthen the protection against development; ensure they receive a fair share of resources; and increase sustainable access. In a similar vein, earlier this year, the DPA joined an informal consortium of organizations, with a shared vision of why we must treasure our landscapes and how government can help. Launched in late January, “Landscapes for Everyone” is a group made up of 27 national and regional organisations, and is believed to be the largest ever to be formed on this issue. Ahead of the General Election, the consortium aims to raise the profile of landscapes and to emphasise their importance to our wellbeing, environment and economy. In addition to these activities, the DPA also participates in a number of local, regional and national bodies. Not least of these is the MoD Access Forum, a body which discusses the need to strike a balance between the requirement of the MoD to train its servicemen and women and the recreational needs of the general public. Perhaps more than ever before, the National parks are threatened by the unmitigated drive for economic growth, cuts to public expenditure and the erosion of the safeguards which protect places like Dartmoor. There is a very real danger that these incremental changes will result in an irreversible loss of the unique qualities which make them such special places and this underlines the need for independent bodies such as the DPA and its sister organisations. In the summer of 2014, the Heritage Lottery fund awarded a grant of nearly £2 million over the next five years to the “Moor Than Meets The Eye” (MTMTE) Landscape Partnership scheme, as part of a £3.8 million scheme of heritage and conservation projects. Additional funding for the 28 integrated projects has come from the partnership of 13 public, private and voluntary sector organisations, including the DPA . Work on the projects began in August 2014 and the MTMTE scheme’s Project Manager and his staff are now in place at the High Moor Visitor Centre in Princetown. One of the MTMTE projects is the DPA’s Moor Boots scheme, where we will be providing walking boots for young participants in the Duke of Edinburgh Award scheme, who would otherwise be unable to afford them. A pilot scheme, involving one school, took place at the beginning of 2014 and footwear was provided to 8 children. The DPA’s trustees have now committed to fund the project for the next five years and this, together with HLF funding, enabled us to expand the scheme to cover nine organisations in the first full year. At a meeting of the selection panel in March 2015, awards were made to 39 highly deserving school children. We are currently seeking additional sponsorship, which would enable us to expand the project still further in 2016. In February this year, the DPA agreed to lead a project to set up and run a Dartmoor Conservation Garden. This will display a cross-section of Dartmoor’s native plants, within a range of sample reconstructed moorland habitats, including archeological and typical landscape features. The garden will not just be a peaceful place to visit, but is also intended to act as an outdoor classroom, hosting a varied programme of hands-on fun and educational activities for local schools, families, residents and visitors. We anticipate the involvement of a number of local and national conservation groups and have already received several letters of support. A suitable site has already been found – the Jack Wigmore Garden behind the Visitor Centre in Princetown – and the National Park Authority has given its approval for the necessary renovation, improved access and re-interpretation. As well as helping to fund this project, the DPA and other organisations will be contributing volunteer labour and specialist expertise. We have also successfully applied for a grant from the “Your Dartmoor” fund. Working in partnership with other like-minded organisations seems to be a common theme, with organisations such as the DPA working closely together on common issues; another example is the planned conference on birdlife this autumn, with particular reference to Dartmoor’s position as a stronghold for a number of otherwise declining species. We will be working with Devon Birds to co- host the event, which will be held at Exeter racecourse, and we anticipate having a very interesting and informative day out. The declining trend in membership numbers has slowed this year, with a net loss of only nine members. Membership therefore still stands at around 1700, about a third of whom are life members. In September, the trustees held an “Awayday” to discuss the direction and strategy of the DPA and this has since been translated into a revised Management Plan, setting out the Association’s priorities for the next three years. One of the priorities in the Management Plan is a review of the Association’s governance processes to ensure that all of the necessary policies are in place. Following feedback from a number of DPA members and the general public, we have started work on a re-design of our website and hope to complete it in the early autumn. We continue to post regularly on the DPA Twitter account and Keith Ryan maintains his blog describing our conservation work. In the coming year, we will also be looking at ways to increase membership and donations, and to improve our publicity and PR activities. Our walks leaders have organised 25 events and guided walks in the year to 31st March. Among them have been a First Aid training day; a workshop on understanding upland ecology; visits to archaeological sites on various parts of the moor, including Bellever and the medieval farmsteads at Hutholes and Dinah Clerks; and a walk to the Mires Project at Flat Tor Pan. An attempt was made to build on the success of last year’s barbecue, by holding a similar event in May 2014. Unfortunately, poor ticket sales meant that it was unable to go ahead. The Ilsington Country House Hotel hosted 100 members and guests for a very enjoyable and entertaining Christmas Lunch. Our volunteers celebrated their efforts with their regular social gathering, held at Princetown in March. 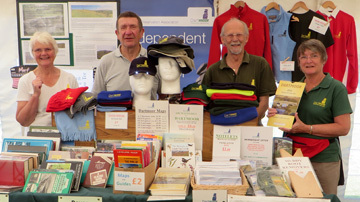 Once again, the DPA had stalls at Dartmoor Folk Festival, Chagford Show, Lustleigh Show and Widecombe Fair and also at the High Moorland Visitor Centre Christmas Fair. When sales made at the Christmas Lunch were added to the ones made at these events, our hard-working volunteers and trustees had generated total sales in excess of £2,000, a notable contribution towards reducing the deficit. 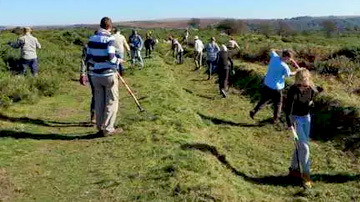 In addition to ongoing projects and the monthly land conservation work carried out at High House Waste, the volunteer group, co-ordinated by Sylvia Hamilton, took on new ventures in 2014 – the Sittaford Stone Circle, the restoration of Bovey Pottery Leat and the clearance of gorse at Common Wood near Horndon. In September, our Conservation Group was joined on a weekend work-day by members of the Moor Poets group for a day which combined conservation with inspiration. Volunteering hours will be down somewhat in the year to the end of March 2015, mainly due to adverse weather conditions causing work to be cancelled or postponed. Nevertheless, income amounting to around £1200 has been generated by our volunteers and this, together with a “Helping Hands” grant from the DNPA, has helped to support the DPA’s running costs and to reduce the Association’s deficit. Meanwhile, the DPA Survey Team were busy surveying two sites on different sides of the moor. The first was Yar Tor stone row, which needed to be cleared of vegetation prior to being surveyed. Unfortunately, bad weather meant that the planned work needed to be re-arranged to March 2015. In the spring and summer of 2014, the team was asked by DNPA to carry out a survey of the medieval settlement just to the north-east of Hound Tor. This is a very interesting site, with several Medieval buildings built into a Bronze Age settlement. Despite wet weather hampering their plans, the team produced an excellent survey for the DNPA archaeology team. As well as these sites, the project to survey Roundy Pound near Burrator Reservoir continues. This is a large and site yielding some fascinating information and the plan is to begin to survey the rest of the site in summer 2015. In February 2015, Alison Clish-Green attended her first meeting as a co-opted trustee, which brought the Board up to its maximum permitted membership of twelve. Alison has been formally nominated for election as a trustee and her biographical details are contained elsewhere in this publication. Unfortunately, due to health reasons, Nigel Hoskin felt unable to continue as a trustee and offered his resignation in February 2015. Nigel’s wisdom, incisive contributions and ready wit will be greatly missed and we wish him a speedy recovery to full health. Norman Cowling and his fellow trustees have worked tirelessly on matters as diverse as planning advice, merchandising, volunteering and campaigning, ensuring that the DPA remains a well-respected organisation, both locally and nationally, and frequently punches well above its weight. 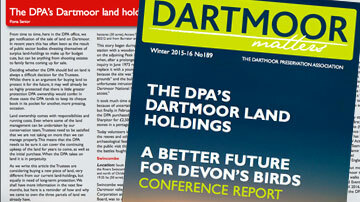 Fiona Senior has taken over the role of editor of our magazine, “Dartmoor Matters” and has seamlessly maintained the high standards of her predecessor. In my first year at the DPA I have constantly been impressed by the generosity of its members, who contribute so much to the Association’s success. Your time and support are what makes the DPA such a respected and successful organisation. Thank you.